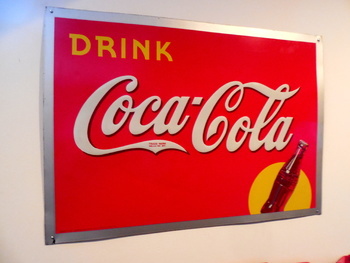 In Coca-Cola > Coke Signs > Show & Tell and Signs > Tin Signs > Show & Tell. Recently I was able to upgrade my embossed 20"x28" Rising Sun Bottle sign for 56% book value. I was the only bidder for this near mint 1938, dropping in at last second on seller's starting price. Two weeks later I sold my lesser (still nice) condition 1940 equivalent for the same price. Nothing sweeter than a "free upgrade" when collecting old Coca-Cola signs. 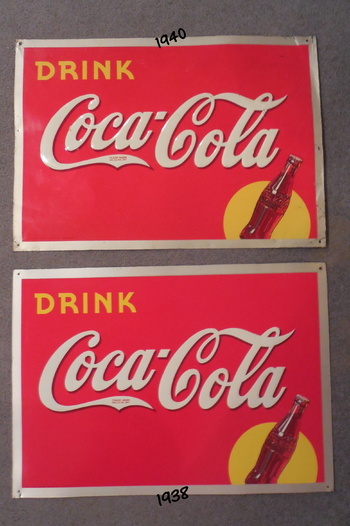 It can be done, or better, in the mysterious world of eBay bid auctions. I have yet to figure them out. Hi eye! ;) how you doing? Haha it's a lot of coca cola signs :) give me a quadrant, upper left, lower right, etc...or just overall? eye, the yellow orb behind the bottle, rising majestically, illuminating a beautiful... bottle of Delicious and Refreshing... I've heard is called the rising sun sign, I think. Maybe setting sun? Also, I'm squinting at pic 4 but I don't see it. Best guess: Richard Nixon. Hi Jewels, thank you. Glad to see you back. Your posse missed you I think. Thanks Chad. Sort of anticlimactic. 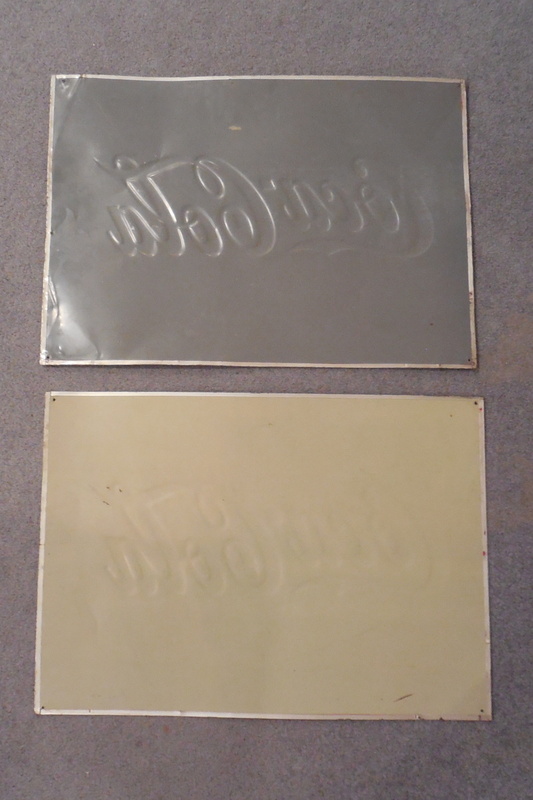 But the scratches on the other one bothered me a bit. There are so many rough signs out there, hard to find in this condition without paying an arm or a leg. Appendages intact. OH...that's a good 'un for sure!!!!! Signs are hot right now. What is up with eye4beauty? 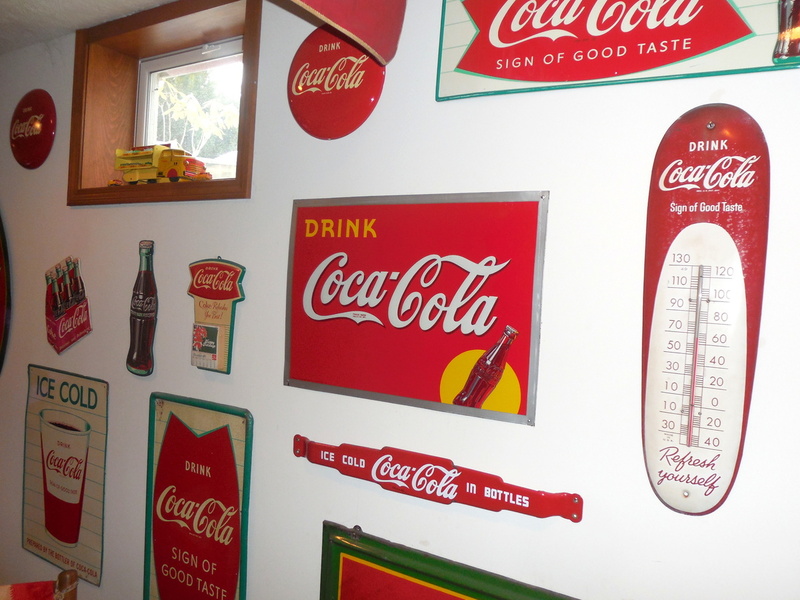 What is going on is a great collection of REAL collectible items! I think you've got it figured out quite well Dave, a free upgrade sounds like you know what's what in the magical world of flea bay!!! And you call that sign what-ever you like buddy! I'd call it a keeper!!! Thanks Bernie, you know how much I appreciate your comments. and thanks eye now I can stop squinting, tilting my head side to side! Funny, I feel that way when looking at spreadsheets. It's the dominant left-side right-side brain thing. Good to hear from you Julie. Hi Katherine, Jewels picked up a six pack and now she's over in the arts and crafts aisle! We had to bring in extra security. Great sign! Colors and border are fantastic! Yes I believe so. 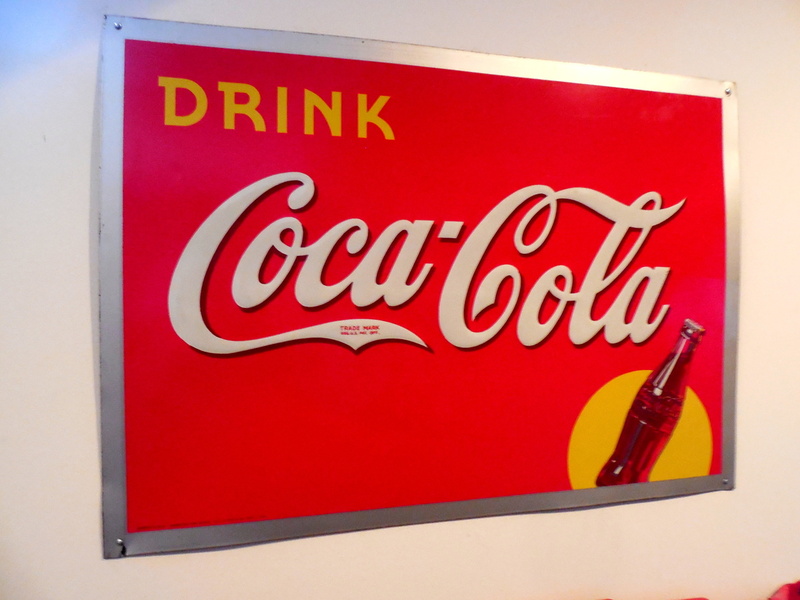 For me, one of the things that drew me to Coke signs was the way the red popped against the off white back drop of the long walls in our basement. I still remember hanging that first sign. I was hooked by a vision of covering the whole room. Sometimes I look around and can't believe I did it.